Madikizela-Mandela, who passed away on April 2nd at age 81, has been regarded outside of South Africa as undervalued and overshadowed by her ex-husband Nelson Mandela, to whom she was married throughout his 27 years in prison. She was instrumental in the anti-apartheid movement, which landed her in prison where she was reportedly tortured and kept mostly in solitary confinement for 17 months. After being accused of inciting violence in the Soweto student uprisings of 1976, she was banished from Johannesburg to an isolated rural town for several years. She was elected to Parliament in the nineties after her return. She became a divisive figure as her politics seemed to veer from those of the African National Congress toward violence in the 1980s. Her words have been interpreted to condone “necklacing,” murdering apartheid informers by wrapping a tire around their necks and setting it on fire. She was convicted of kidnapping a 14-year-old anti-apartheid activist accused of being an informant, whose body was later found near Madikizela-Mandela’s home. The boy’s mother reportedly attended the funeral and says that she has forgiven Winnie. Madikizela-Mandela’s reputation was further smeared after being accused of having an affair. To those of you who vilified my mother through books, on social media, and speeches, don’t think for a minute that we’ve forgotten. The pain you inflicted on her lives on in us. Praising her now that she’s gone shows what hypocrites you are. 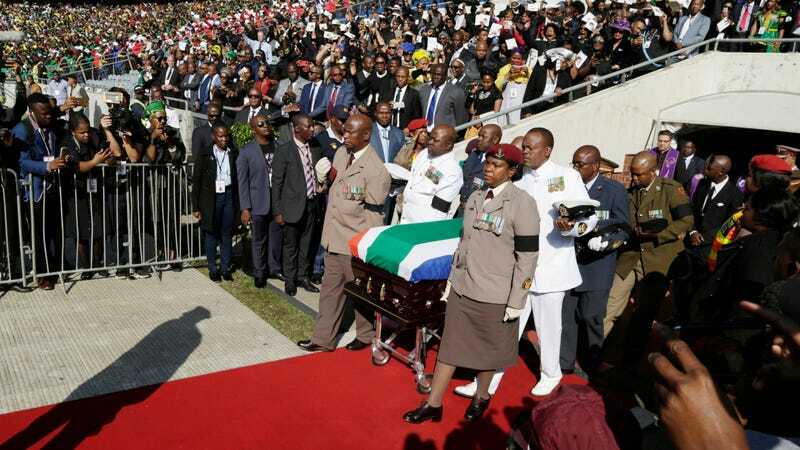 South African President Cyril Ramaphosa delivered her eulogy, reciting Maya Angelou’s “Still I Rise.” “She bandaged our wounds,” he said, adding, “We did not do the same for her.” He recognized, as well, that Madikizela-Mandela’s fight spoke to the injustices in the United States. She lives on in the African-American woman‚ who though she lives in a country of great prosperity and progress‚ is still weighed down by the accumulated prejudice of generations. Madikizela-Mandela will be buried beside two great-grandchildren, the Sunday Times reports.